Investing the Abbey: “Such Treasures these, that...” continued. The next shelves showed things other than 'glossy advertisements', which seemed surprising to me, at least until I found under the flung-aside dusty cloth – a cloth that went to rags as I flung it, and it landed in unraveled threads growing dusty upon the filthy floor – a number of things, these individually wrapped in their own armors of rags. These, unlike the covering sheets, had a much-different appearance – one that looked as if generations of moths had seen them as choice meals. “That thing?” I asked, as I pointed to the topmost article in the small mound, this corralled by a going-to-rust wire basket that once had been painted a deep and unnaturally glossy black. I reached to touch it, and as my finger got within an inch of the rectangular object, the faint static-like charge of the thing seemed to warn me off. I touched it anyway, and the red-flashed eruption under my finger sent a puff of smoke into the air. The smoke vanished with a soft thump and a faint flash of bluish light, and from somewhere – where – I could not tell, but I knew it wasn't that far away – my ears strained themselves in hearing an animalistic screaming noise that segued to the sound of running feet and the thundering booms of 'large muskets'. I felt reminded of 'roers' and 'loopers' – so much so that I hoped those weapons were being used for dealing with such screeching witches. I then saw the 'obvious' nameplate that had once been wrapped with such 'touching' care. I wondered for an instant if witches did up 'mummies' of their dead – and then noticed the nameplate slowly shrinking as I looked at it. It was more than a little surprising to suddenly find an obvious 'DÖDGE' nameplate showing after finding the vehicle's 'real' or 'front' nameplate. This one was a 'find' of some kind, and I wondered if it was one of those recovered by that one unnamed covetous witch. 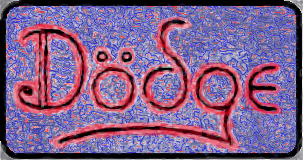 “That is 'official DÖDGE' script,” said the soft voice. “Keep looking in those baskets. They'll hold together until you look at all they hold.” The unsaid portion, was 'all of what you find, commit its salient characteristics to memory, as it's important'. I set aside the nameplate, and as I reached for the next part in one of the three baskets, I saw the nameplate slowly crumble into dust – and then the dust itself seem to blow away in an invisible wind to vanish as I touched the next article. Its rag covering went up like flash-powder under my hand, and again, I asked its slow-drifting remnants to 'go find and then soot up a witch' as I looked at my hand and saw it untouched even by soot. “You know what you're doing when you speak that way, don't you?” asked the soft voice. “Uh, examining these parts so as to commit their shapes and whatever else I can to memory so I can recognize them when I see them again?” I asked. I knew that was a dumb answer the moment I finished speaking. “Roers?” I asked. I wanted to ask about the idea of teamwork under such circumstances, as it sounded like a good idea in general. “Those are fasteners, aren't they?” I asked, as the plating utterly gave way to a dust-dribbling whitish corrosion on first one such spike and then another. Where the chrome was gone on the other pieces, the metal below it first showed the dusky yellow of 'bad' brass, then a poisonous blue-green speckled color that roosted in fast-growing pockets of corrosion, then a grainy bluish 'sand' that vanished into faint dust as it trickled onto the shelf below the one it sat upon through a rusted-through place on that particular shelf. The whole thing was 'going to hell' in a hurry, and my thinking that way but accelerated the process of the handle's dissolution. I just hoped the shelf would endure long enough for me to examine that which I needed to look at, as it too was rust-ridden and dusting down red-brown powder whenever I looked at it too closely. “Probably about as poisonous as 'cheap' arsenic,” I muttered. The next rag-wrapped article was tied with a species of unnaturally-darkened coarse string, and before I tried picking it up, I asked the string tie the feet of a witch. As the string vanished and the rag went to dust and soot – I asked that to burn its way into the skin of a witch such that it was indelible, and more, that it marked that stinker as a witch until he or she died – I gasped. I laid the mirror down once I noticed the two 'bullet-creases' in its metal and its 'heat-warped' aspect, but after I had laid it down and began reaching for another rag-wrapped part, I glanced back once more at it. Not merely was it too beginning to go the way of all fetishes, but I seemed to see the thing wreathed in flames. I did not hesitate; I knew what such flames meant to me. “Go into a witch's house and set it alight,” I muttered. “Explosives merchants?” I asked. I had the sense this person had received at least some of his stock by sea, as he was fairly close to a surprisingly deep 'canal' or something similar that connected to the sea. “One less witch, then,” said Sarah. I set the piston down, and as I did, I felt the thing crumble into chunks that 'corroded' so rapidly that the thing was a soft-sifting mound of yellowish dust but seconds after I laid it on the shelf. I asked its remaining chunks and its dust to go in a witch's stew-pot – and to my astonishment, I heard faint giggling. “The roadhouse..?” I asked. I wondered just what a 'roadhouse' was in witch-parlance. “And hence the dirty dishes will..?” I asked. The next part I unwrapped was an obvious hubcap, this dented, fire-damaged – the plating was 'torn' and 'lifted – and gashed by something sharp such that it was torn nearly in half. The 'DÖDGE' marking, this in thick red 'paint', was effectually 'crossed out'; and I asked that it go find the privy of a witch and 'roost' in the stool so as to throw whatever dung the witch or witches dumped in back at them. “What did you mean by that?” asked Sarah. “Is she removing clues?” I thought. The first of the three baskets was now nearly empty, save for the bottom pieces. I removed another piston, this with a top that was broken through entirely; then two more like the first piston I had examined, another 'burned-out' piston, and then finally an obviously damaged piston that went to pieces in the process of my unwrapping it. The sharp-edged fragments were blackened, burnt, and all-but disintegrating as I handled them. “Detonation, most likely,” I thought, as I set the mound of going-to-powder metal fragments down on the now very rusty shelf. It was dusting down rust rapidly, and I could see holes showing. “Now each of you piston-shaped fetishes find a witch-kettle or whatever those things are called in witch-run roadhouses or Public Houses, and turn into a really bad version of magnesium citrate – one that altogether dumps its consumers' tripes into the privy when it decides it's time to act.” I then had a question once the pistons had vanished with a chorus of thumping noises. “What is a roadhouse?” I asked. 'It' turned out to be an octagonal-headed gas-cap, this showing 'official DÖDGE' script on the shiny 'stainless' head in embossed red letters, and the near-intact aspect of the thing – save for its checked and cracked corrugated rubber gasket, it looked as if it came off of a parts shelf recently – made for wondering, especially as to whether people stole parts off of 'DRAŠTIC DÖDGE' vehicles when and where they could. “They probably worked passably,” I murmured. The rest of that bin turned out to be more blackened pistons, these to a different engine entirely, as they had but two valve cutouts – one on each side, such that I suspected the engine had a hemispherical combustion chamber – and a pronounced domed portion on their tops, which all but confirmed my suspicions. They too were ready for scrapping, and after sending all eight of those crumbling-to-dust scrappers to the stew-pots of witches, that first basket was now empty – and as I reached for the second basket's contents, the first basket 'lost all restraint' and went to powder and faint clouds of dust with an empty sighing sound. I wondered if I had heard its dissolution with my ears. The next basket of the three – as well as that basket which lay to its right – was filled with rag-wrapped items of a troubling nature, and when I removed the rags from the topmost item, I found a glass container that looked enough like those infernal 'IV bottles' that I found the resemblance frightening. I held my lantern close, and made out the raised red letters 'KÄSTRÜL-R42' in the otherwise clear glass. Clear save for a species of dark brown 'varnish' coating part of it, that is. Sarah was pointing at what I was holding, and I set it down quickly. I did so just in time, as it – and every other such bottle I had unwrapped thus far – went to fine sparkling dust with a faint constellation of crunching noises. Sarah had more comments, however, even as I mentally asked the glass particles to find the beds of witches so as to 'give them the itch'. “No evil engine is that thirsty for grease, not even those with more than the usual numbers of holes.”	Sarah seemed to have 'inside knowledge' of some kind to speak with such assurance. It made for questions on my part. “What else did you do?” I asked. The shelves above the three baskets had more of these dust-filmed bottles, and as I handled them and set them down on the shelf which had once held the three now-vanished baskets, they kept going to dust within seconds. This grainy dust had a definite 'itchy' aspect hiding among its myriad of salt-like cubes, and I now asked it to find the clothing of plain-dressed witches so as to make them easier to find. In each instance, the stuff vanished, and after one such instance, I heard – this plainly, with my own ears – a scream coming from outside. It was answered by a dull booming of gunfire that petered out over the course of seconds. “Sounds like you're clearing out every witch that thought to endure in this area,” said Sarah. I turned and left the shelf, and as I walked toward Katje – she and her 'crew' were working on the packed section to the left of the entrance, much as we were taking inventory of those things lining the right path – I marveled at just how much 'junk' she'd brought outside. A glance as I passed the doorway showed no less than three medium-sized desks outside, these dusty, old-looking, mostly metal, and obviously yet-usable; and a broken-up jumbled pile of wood chunks mingled with grainy 'sawdust' steadily coming from those pieces made of wood-substitutes. The growing mound of sawdust I saw was quite sizable, and I hoped those paper-interested individuals could make ready use of such material. “Best to bag up that bad wood and stack the sacks someplace easy to get to,” I thought. I then saw clearly what Katje was pointing at. The seeming sturdiness of the thing's execution – it looked as if made prior to my birth where I came from, and that by a high-end company – made for wondering, at least until I saw the 'cast bronze plaque' proclaiming the name of the thing in runes. The first rune was the open mouth leading to hell, the second meant night or darkness, the third was a tool of manipulation and control, and the fourth was the command-formative that sent out the hell-spawned manipulation that ran amok in the witch-authored darkness the device was designed to 'spawn'. It seemed a prime fetish, so much so that I nearly forgot to commit its details to memory before 'disposing' of it. The first items I noticed were a number of round metallic disks that reminded me greatly of the finned cylinder heads of larger model aircraft engines minus their glow-plugs and hold-down screws. These were in sockets, much as if they were a species of vacuum tube; but a brief touch of their surface spoke of an unnatural chill, one far deeper than any mere metal I had felt here. These things seemed to live in a freezer, they were so cold. It made for a question. “Did those run things hot?” I asked. “What are they, then?” I asked. “A 'crude' species of integrated circuit?” I was thinking of thick-film circuits, ones similar to those I had seen in some older automotive devices where I came from. “And the knobs?” I asked. Instantly, the markings blazed redly on each of the gray-black controls, and by each control showed a small white tag. The uppermost knob, that near the pedestal that supported the tone-arm, was labeled 'volume', the one below it 'tone' – that one had some indication that it wasn't merely rotated, but had several positions that one activated by a combination of dexterous manipulation – both axial and radial manipulation – and the correct curses, such that its true function was a multiple-band active equalizer with some truly unusual traits – and the last knob was labeled as being 'loudness'. As if it had been waiting for me to send it where it belonged, the turntable lifted up from its 'last resting place', then as I moved out of the way it shot out of the room and did a hard left as it accelerated – and then, with a rush of gusting wind it blasted out of the Upper Alley and accelerated into the wild blue yonder as it left for its last home this side of Hell. “Break on through?” I asked. “The m-message that defines evil?” I asked. “I thought so,” said Sarah, as she retraced her steps. I hastened after her, as what we were about to find was of grave importance, and when we came back to the shelf that had held the engine parts, the thing had already lost its structural integrity and was beginning to collapse with faint squeaks and spurts of red-brown rust. We left it to its dissolution, and passed by two more such going-to-rust shelves to find a 'framed' picture of some kind pasted over with a coarse species of cloth. My putting my finger to this last caused it to go up in smoke, soot, and a flash of flame and sudden shock, and I asked that the soot find itself in the coach of a witch gathering his things up for the trip north. And as if to answer, faint, so faintly that I wondered if I was hearing it conventionally, I heard a rumbling roar that segued to a series of thundering detonations. “What is that thing?” gasped Sarah. 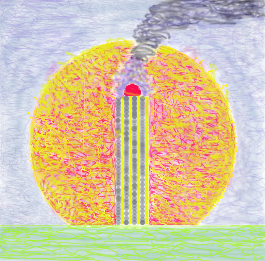 “And modern-sulfur-candles are a pale shadow of what I see here,” I muttered, as I saw the red-flamed ball heavily streaked with yellow hiding in the tall long shadows of a yellow and gray striped red-flame-burning smoke-palled 'chimney' that left a thick and noxious sable plume of slow-growing smoke. The blue-streaked green 'floor and the chilly gray-blue 'sky' behind it were both utterly unnatural creations of a cursed realm: the blue-streaked green was not that of grass, but of bile; and the gray-blue showed a sky devoid of light and so crowded with thick and noxious pollution that no life lived save that which could endure such pollution readily – pollution both physical and moral, so much so that nothing lived, save by curses – and all of those things that lived, they lived by curses alone. “Why did that thing do that?” asked Sepp. Sarah and I were now alone on the right side; everyone else was clearing garbage and 'other matters' out of those areas 'devoid' of fetishes, as this room was not merely large, but Katje had indicated it needed to be cleared out as much as was possible. “Does that one still exist?” I asked. “The fires of hell,” I thought, “and the black smoke, that being symbolic of power and the might of dread curses; the yellow sun, ablaze in its glory, such that it overshadows the usual color...” I paused. “What is the sun here normally for color?” I asked. The first portion of falling into hell, according to witchdom's beliefs – their truth – was that the sun would be erased, and the world would then be darkened. There, by virtue of their 'blackness', the witches would show forth then all the more, and therein acquire preeminence. That thought blanked and then was replaced with the true reality. The witches would show forth all the more because of their darkness without and within, and when the arrival of Brimstone commenced, there to take ownership of the planet as his vouchsafed due, those especially darkened realms within that feral and all-encompassing darkness would become especially beckoning to himself – and he would visit those people and locations first, there to take his foreordained meals. And with that last thought, the 'scroll' before me, frame and all, crumbled into dust with a slow crackling sound to sift foul-reeking dust down in slow-drifting and noxious gray-tinted clouds. Our further travel down the long and narrow shadow-strewn pathway was next attracted to another shelf, this one strangely intact and covered with a single dusty cloth. The latter was also near-intact, and when my hand came near, the cloth went up like flash-paper to show a carved grainy wooden bust, this of such horrifying nature that I shrank back and got in front of Sarah so as to protect her. “What is that thing?” I gasped, as I shook in horror. I had never seen anything quite like this before. “Such strange eyes, and a pointed head...” I then realized just what I was seeing: while the thing did look vicious and horrible, an idol with a pointed head was too much. I almost laughed at it, it was so ridiculous-looking, even as more of the formerly glossy blue paint covering the thing flaked away to show the haphazard 'grain' of the wood. For some reason, I was reminded once more of 'particle board'. As if to remind me of unguarded speech, the idol vanished with a plop and a faint reek of ozone commingled with burnt rubber and perhaps a hint of acetone – and not two seconds later, my mind all but exploded with the sounds of deep-pitched hoarse screaming. 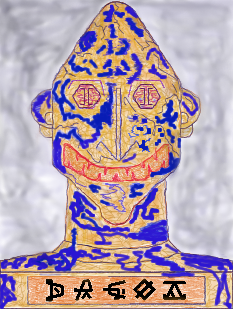 The idol had shown up, complete with a full – and new – coating of bright blue paint in the huge and darkened antique-choked house of a very wealthy witch while said wretch was 'entertaining', and as the black-dressed drunkards gathered in thick stuffed chairs around a massive fireplace crammed with crackling part-seasoned logs, the idol showed upon the wide half-circle-shaped stone hearth with a muffled 'thud'. The witches took perhaps two seconds to notice the idol's presence; then their drunken stupefaction was replaced by a warlike ardor, and as they began to fight among themselves with long pointed daggers so as to have this new-arrived fetish for their very own, the idol hopped – just like a frog weighed down but somewhat with buckshot – into the fire, and as the battle raged among the curse-spewing scuffling witches and the idol began 'dancing' amid the flames, the choking fumes of first the accursed blue paint, followed by those of the thrice-accursed binder, and then finally the poisonous gases made by the wood particles – these lethal fumes began spreading in the wide rooms and the hallways of the massive house. The fighting witches didn't notice the fast-spreading fumes until they all were gasping for air, hands on throats and dropping to their knees, while the other occupants of the house – witches apparently had large retinues or families, as this huge house all but swarmed with witches and those who wanted to be witches – slowly fell or tripped over their stumbling-drunk feet as the fumes continued to spread with the speed of harried quolls. Meanwhile, the dying witches were now being set alight by the newly-freed spirits formerly bound to the idol as it came part to finally burn free of all 'enchantment'; and as the words to a certain long-worded chant rang out clearly in the house with ghostly precision, the dead and dying witches, now wreathed and coated by flames that devoured their starched clothing and then their flesh with avidity, began dancing a strange and jerky spirit-ridden dance in time to certain of the words of the witch-song. These words, of course, were the following: “dance on fire as it intends,” and the witches were doing precisely that, much as the idol had done once amid the flames. “That place has so many of those stinky things it's ridiculous,” I thought. I then noticed that I was not merely speaking out loud, but I was smelling something strange, almost as if I myself had barely escaped the flames of the witch-warren. I then absent-mindedly swatted off a thin dusting of soot from my arm. “You saw it?” I asked. “How?” I was really smelling that huge fire now, and I wondered how that reek seemed to be boiling off of me like bad year-old sweat. “It had a head shaped like that of a pin,” said Katje, “and eyes that looked as if made of buttons, and this mouth stolen off of one of these fish they have in the sea, and...” Here, Katje could not contain herself any longer, and howled with laughter. “If you cannot flout Brimstone with verses from the book, you can always laugh at him and what he likes,” I muttered. I then noted what the idol had hidden by its presence, this being a glossy black and white 'advertisement' of sorts – and that explained to me exactly what we had seen, and more, answered a host of recently-born questions in my mind. “I thought so,” I muttered. I then kept my lips sealed, this by effort, and thought, “so the witches of that time used names out of the book itself.” I then noted the reddish aura the 'advertisement' seemed to be gathering to itself, which meant that the 'idol' – that hideously-overpriced 'bad joke' of a carving – was hiding a real curse under it; and seeing 'money-manipulation-answers' – 'disgrace-walking-travel' – 'gates-walls-fortress-strength-power-predator' – 'mouth, specifically dealing with hell' and finally 'darkness and night, this both physical and spiritual' made for a brief wondering. Both as to what the curse I was looking at actually meant, and also, if it was a curse. The combination made but little sense to me save if the runes I was seeing were used as letters to spell out the name 'Dagon'. And thinking that made me wish to spit. “Go find a witch's privy, and let that wretch use you in lieu of privy-rags,” I spat. The 'advertisement' vanished with a sudden wind-rushing hush, then from outside, a sudden, long, and loud scream seemed to rend the air. I turned to see Karl carrying the remains of a 'busted-up' chair outside, and as he went out the doorway, I heard him laugh. “But why would they put broken-up chairs and tables in here...” I thought for a second – until I recalled the on-site drink-house the place had once had. “Supposedly?” I asked. That word, especially when Sarah spoke it, had suspicion bound to it most firmly. Sarah was not inclined toward accepting a particle of uncertainty when she could prove matters. I could almost see Sarah nodding. The only reason I had not seen any such tables was that I had had my hands full with other matters when I wasn't actually sleeping – and our room had had its three tables of that type removed prior to our coming, as the witches running the place didn't want to give me those things of power – namely fetishes – that I could use against them. “At least at first they didn't,” I thought. “Those light-giving firebombs came when they decided the rumors were true as defined by witchdom's thinking, and their hope was I would use those smelly smudgepots and be destroyed by them during a moment's inattention.” I then came back to the 'present'. Filing cabinets, these looking ancient with their faded filmy green coating now showing huge blotches of rust, and sometimes, genuine holes where the curse-halted action of time had been quick to seize its new-given opportunity to devour all held precious and dear to witches. Desks, these commonly of wood leavened heavily with either 'Bloatwood' or that cheaper wood substitute. They were crumbling as I watched, save when and where the pieces of real wood provided strength beyond the capability of mere curses and chants. Chairs, these usually of a singularly poor grade of wood reinforced here and there with gone-to-rust pieces of metal. A longer side-glance spoke of wood being used to 'hold the ground' with 'the cheap stuff' used when and where it could be used otherwise. The relative dearth of chairs we had seen outside of those two secretariat rooms – if there was a chair in an office, it commonly had bones or the remains of bones upon it; otherwise, if an office had no skeletons, it had no chairs – was now explained. They had been gathered here so as to 'protect' them. From what, however – I had no clue. Two 'office chairs' blocked my way. I moved one to the side, then the other – and learned that I could not move, save if I leaped like a cat to then bang my head on the too-low ceiling. “Things?” I asked, as I moved one of the chairs into the aisle so as to 'roll' it out on its six – or was it seven? – crumbling-into-dust casters. “They look like chairs to me,” I said, as I began to move the one I had back through the maze. The thing was wasting no time in coming apart on me, as I was leaving trails of what looked like smoke with each step – or so I thought until Sarah sneezed. “That thing is leaving dust behind you,” she said. As I came to the in-and-out passage of wood-bearers, however, the 'chair' I was pushing lurched to the side and down, and a tormented rumbling screech of falling-apart rollers and cheap going-to-rust metal colliding with the floor set my teeth on edge. I could feel the 'chair' seem to scream and squirm as I carried it, then when I came out of the room, I noted 'neat-looking' piles. As I wondered where to put the chair, I could feel its 'rivets' popping as if they were kernels of corn in a camp-oven, and as I ran through the space left between two sizable and growing mounds of scrap wood, the chair creaked hideously – and as it came apart entirely, I both tossed it hard and leaped back to nearly trip over a broken-to-bits wooden chair. The crash made by the disintegrating chair was enough to set my teeth on edge twice over, and the tormented grumble coming behind me, this noise at once utterly familiar yet totally alien, made me turn to see Sarah and Sepp manhandling a chair that was trying to trip both of them up – this, with its seven spidery-looking legs – and come apart as quickly as it could manage the job. I could see small metal fragments coming out of the thing amid dustings and spits of powdered rust. “Wheels like a coach?” I asked, as we went back into the room. Sepp needed a breather from his wood-carrying, and while the others continued their steady labor, he came with Sarah and I. “Why are they all working on that wood?” I asked. “Wondered?” I asked. We were come to the desk that the two chairs had sheltered, and now I knew why we wished three people. This was a metal desk, and more, it wasn't cursed save by being used by its long-ago users. “That one witch probably stole it,” I muttered. “The price of a witch-house?” asked Sarah. “Probably died there,” I said. I then learned another aspect of the desk when I tried to move it. It was heavy, and it needed both opening its upper drawers – it had two shallow examples, one to each side of where one sat – as well as 'grunt-straining' the thing with Sepp clambering over it once I'd gotten it out slightly to then push from the back, to actually move somewhat to the side. As it came to a grinding stop some three feet to the side and turned around ninety degrees, I looked in the drawer I had opened and gasped in shock. “Where did I put that thing?” I asked softly. I had to revise that thought to 'a really big typewriter' once I had gotten the light of my lantern upon it, for the size and seeming heft of the device – a dark dusky gray finish coated with a thin layer of dust; a huge-seeming number, easily over a hundred, of cracked keys showing letters, numbers, and symbols; a dark black roller, this showing a vast number of deep cracks in its dessicated-looking 'rubber'; a number of surprisingly shiny rods parallel to the roller serving as 'paper-holders'; several areas where the upper body of the machine showed dirt-crevassed cracks and seams; and finally, a number of obvious long-levered switches, these of archaic form and part-hidden along each side. I was so lost in the process of 'inspection' and committing these various details to memory that Sarah's voice startled me when she spoke. “I've seen them before also,” I said. “I even used a few at one time or another.” I recalled the letters of one device, these belonging to one especially troublesome unit that I had been coerced into typing the first few of my stories upon. These were for a class in the writing of short stories, and the two examples I'd submitted were both mind-raveling outpourings of raw terror. One fellow-student spoke of them as being 'too intense for him' – and that seemed a common theme in the whole class. “Yes, you're right,” I said. “Those I used were smaller, and, uh, looked a bit more workable...” I tried touching one of the keys, and to my astonishment, the grating noise as the thing balked at my touch was only exceeded by a faint screech like that of a distant dying rat and a spurt of dust from the 'pit' where the type 'lived' when not in use. “Did you use a scribe for what you turned in?” asked Sepp. “No one, as far as I know.” Sarah seemed uncommonly certain of her words. “Not across the sea, though,” I said – though the instant I said so, I knew beyond all doubt that my 'guess' was dead wrong. While typewriters were seldom used where I came from at the time of my leaving, there was something about those secrecy-obsessed portions of the world of blue-dressed thugs that disdained anything of an electronic nature when it came to sending important information, chiefly as it was an easy matter to spy upon what those using such equipment did; and as there were vast numbers of blue-dressed thugs, courier-duty was a common means of 'keeping them busy and out of trouble'. And within seconds, I knew that wasn't entirely right either. While there were vast numbers of blue-dressed thugs – and electronic spying, given the right equipment and software, was a fairly easy matter – it was more than merely a matter of busywork and security supplying the reasons for the use of couriers. There was something more, much more – and I hoped Rachel had an answer as to what it might be. “Do they carry papers?” I asked. I recalled speech regarding their use as messengers – bad messengers – but quantity supposedly had its own quality, assuming vast numbers and profligate usage. “What is it?” asked Sepp, as he drew back. Sarah looked at me in the strangest fashion, then wormed herself into an impossibly-small area on the machine's right side. I thought to look at what it was sitting on, and noted the solid-seeming framework of what might be called a typing table, with a rivet-studded drop-leaf on the left side of uncommon sturdiness. It looked capable of supporting a great deal of weight. “How did you know to look for the other part?” asked Sepp.